If you've been following my blog for some time, you've probably noticed that I enjoy using infusions in my cocktails. They're quite easy to prepare if you understand the proper length of infusion time for various ingredients. 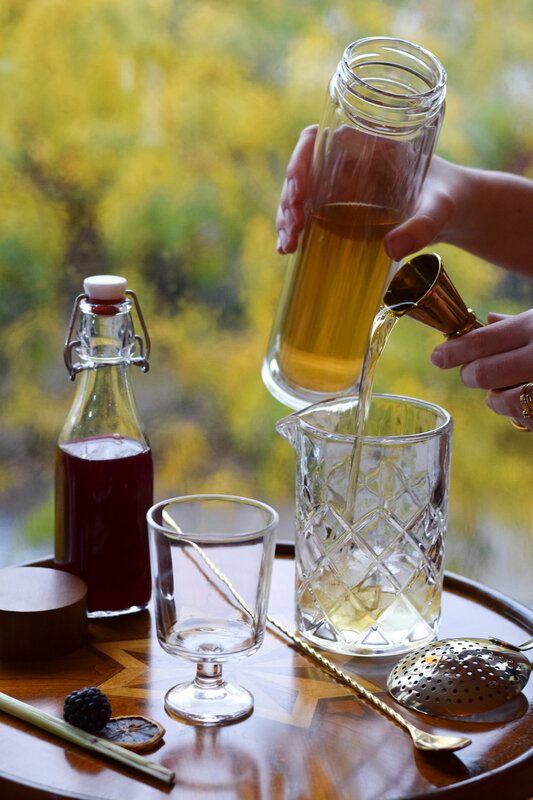 Simply add fruit, herbs, tea or spices to liquor, wait while it infuses, and then strain out all of the solids to stop the process. Infusions are an excellent way to add complexity to a drink because they have no added sugars and don't water down the overall cocktail. I've done infusions for both flavor and color with great results. I was recently approached by the company Teroforma to test 1pt, their newest product line of artisanal spirit infusion blends. This blog is a space for me to share my findings on brands whose ingredients and value propositions I support, and 1pt met and exceeded my criteria. I've typically done infusions with one or maybe two ingredients at a time and then added additional flavors in the cocktail mixing process. 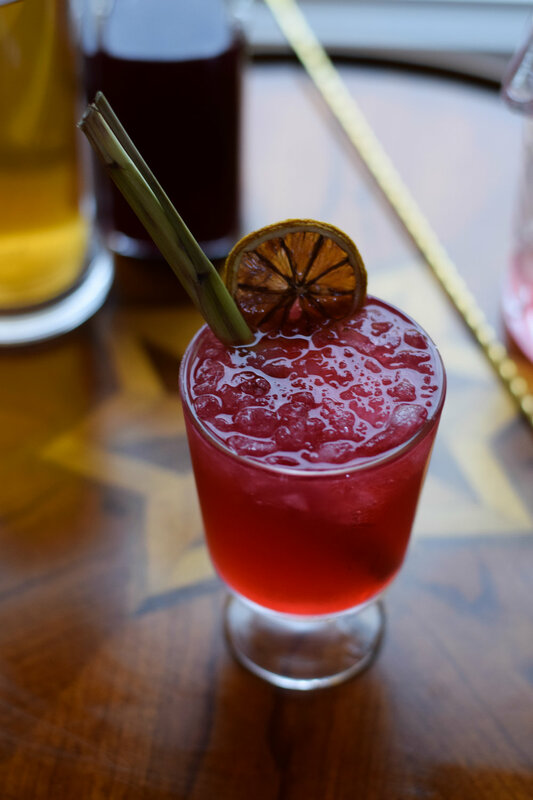 In contrast, all of of 1pt's seven blends feature at least four thoughtfully layered herbs, spices and teas, meaning you don't need to add much to the infused spirit to make a fantastic cocktail. I chose to play with their Citrus Blend, a mix of lemongrass, ginger, lemon verbana, Yerba Mate, and marigold petals. Given the freshness and citrus character of the infusion ingredients, I chose to use a London Dry Gin for the spirit. London Dry Gin's aren't necessarily made in London nowadays but tend to be more juniper-forward, higher proof, and with a citrus component. Beefeater is particularly great for infusions as it's very reasonably priced, fairly straightforward in taste profile and therefore quite versatile. I wanted to use honey to completely smooth the bite of the gin and thus draw the focus entirely to the brightness of the infusion. Instead of using a plain honey syrup, I paired blackberries with wildflower honey for a pop of color and a delightfully tart fall flavor that I slightly accentuated with a bit of lemon. I then topped the drink with club soda to give it the refreshing feel of a gin and tonic. For garnish, I added a fresh stalk of lemongrass and a dehydrated citrus peel. If you'd like to learn how to make dehydrated citrus peel in your oven, check out this earlier post. The resulting cocktail was fresh, herbaceous, bright and complex. Stir all ingredients other than garnish with ice, then strain into a stemmed glass and top with crushed ice. Garnish with lemongrass and dehydrated lemon and enjoy while taking a deep breath of cool air after a rainstorm. *Infuse gin with 1pt Citrus Blend for 5 hours. **To make syrup, bring 1 cup water and 1/2 cup blackberries to a boil and simmer for 15 minutes. Muddle the blackberries and then add 1/4 cup wildflower honey, stirring just until it dissolves. Allow to cool and store excess in the fridge for up to 3 weeks. If you'd like to try 1pt for yourself, use the code valcohol10 for 10% off orders over $20.